Stems: Erect to ascending, often much branched, sparsely to densely pubescent. Leaves: Alternate, simple, linear to oblong-lanceolate, 1.5 to 3.5 inches long; margins usually unevenly toothed but sometimes entire; lower leaves on short stalks. Inflorescences: Raceme-like; flowers on stout stalks, often at right angles to central stem. Flowers: Sepals 4, in 2 opposite pairs, densely covered with star-shaped hairs; petals 4, pale yellow, 1/4 to 2/5 inch long, clawed. Fruits: Pods, linear, 2 to 5 inches long, nearly circular in cross-section, widely spreading, appear as continuation of flower stalk; seeds numerous, in 1 row. Habitat: Waste areas, prairies, cultivated fields, and roadsides. 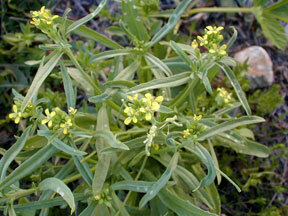 Origin: Bushy wallflower is an introduced weedy species native to Europe.